It's a twist on a classic! When has the addition of bourbon ever been a bad thing? This take on a classic sweet potato recipe will mix things up this Thanksgiving — and it’s simple to make, too. In fact, it’s so deceptively easy that it’s actually a dish you’ll want to sign up to bring to Thanksgiving dinner. Everyone will think it took you much longer than it actually did to make something this delicious. There’s also this very important cooking rule to consider: when cooking with bourbon, the cook deserves a little, too. You know, for taste-testing purposes. All you’ll need to make this sweet potato side dish from Southern Living are sweet potatoes, bourbon, evaporated milk, eggs, sugar and spices. We’re talking cinnamon, cloves — all the flavors of fall here. Yum! Once the sweet potatoes are tender, peel and mash them. Mix in the remaining ingredients and then all that’s left to do is bake it and enjoy that bourbon! There’s definitely some room to play with this recipe, too. You could always add a classic marshmallow topping for a side dish that’s extra sweet. Adding marshmallows on top near the tail end of the baking time will yield perfectly toasted marshmallows on the outside of the casserole. 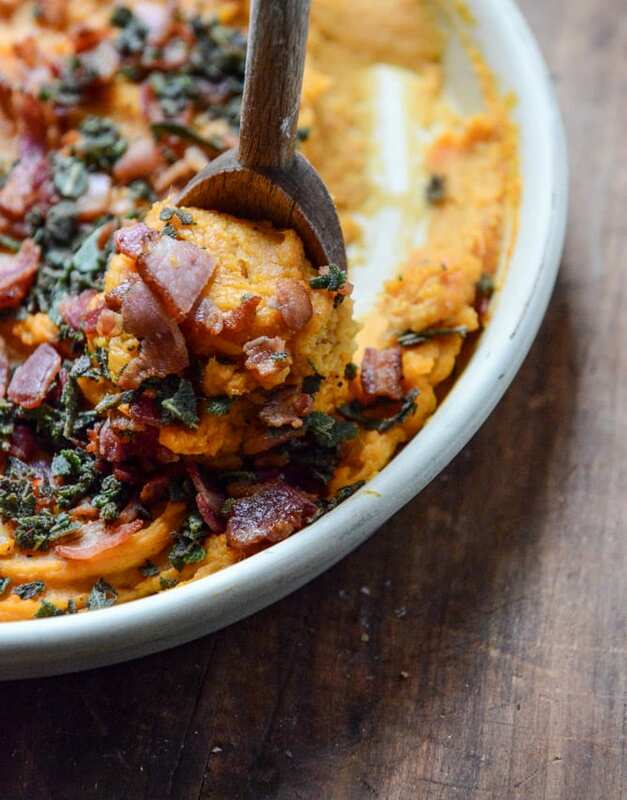 You could also go a more savory route with your sweet potatoes this Thanksgiving. This recipe from How Sweet Eats adds bacon into the mix. Bacon and bourbon? That’s a double whammy! 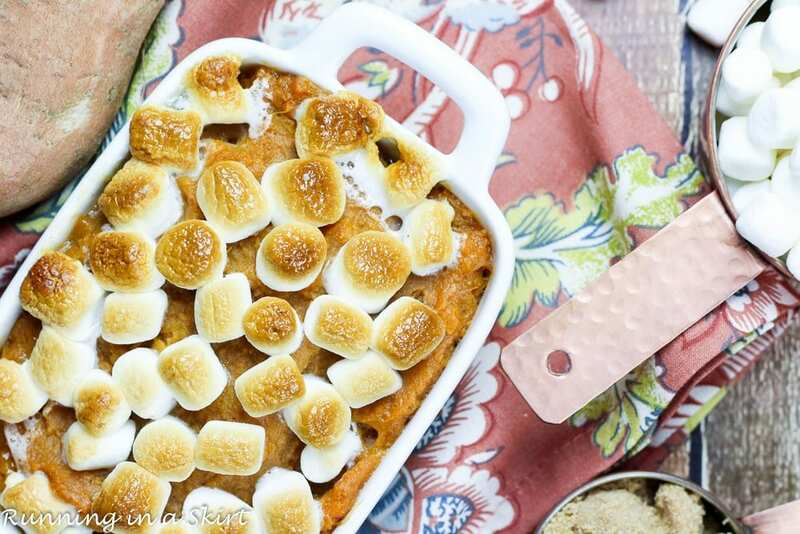 The recipe also points out that the sweet potato casserole base can be cooked ahead of time and stored in the fridge overnight. Then the pecan mixture can be added and baked so your potatoes are warmed and ready to serve — without all of the work on Thanksgiving day. 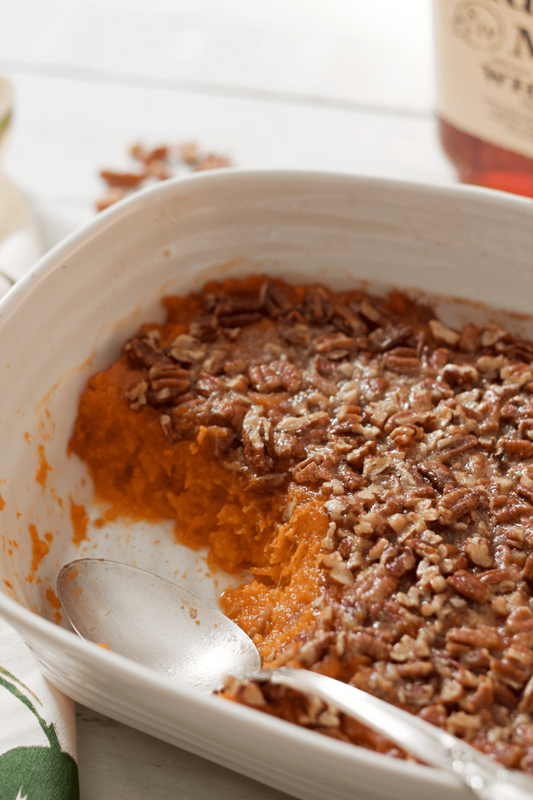 So who’s ready to make sweet potatoes the most-loved side dish this Thanksgiving? Trust us, a little bourbon will go a long way!